An all round entertaining, if some what grotesque, read. Cullen Bunn has slowly been increasing the scale of this little horror comic and the narrative is now world consuming. A prime example of a horror comic done well. 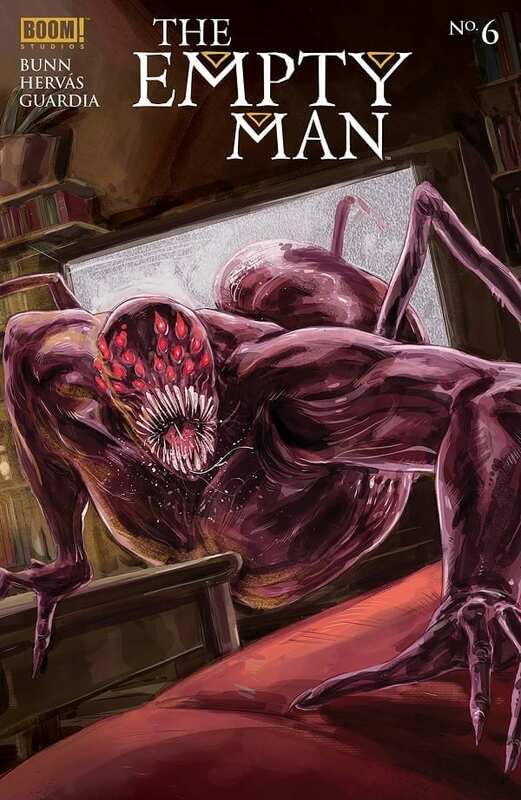 The personal stories of trauma and resilience which have filled the pages of The Empty Man in the previous issues take a back seat as Cullen Bunn opens up his world of horror. As one of BOOM! Studios adult comics, The Empty Man doesn’t pull any punches and the grotesque levels continue to increase. 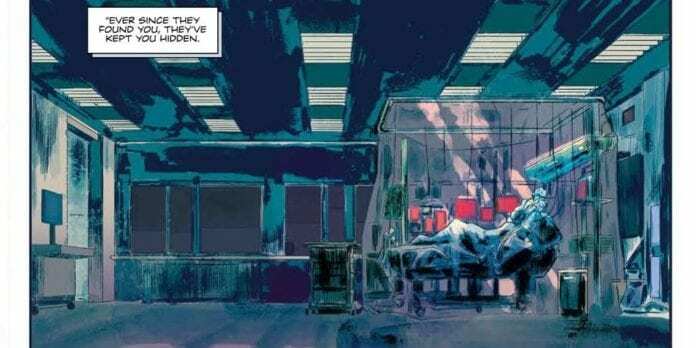 The series is building towards a world shattering conclusion later in the year and this issue gives the readers an idea of the scope of the narrative. The heroes safety is slowly diminishing in the face of the world wide catastrophe. So far the story has been centralised on a few characters fighting to survive in a world that is crumbling around them. The wider world has been featured but up until this issue the character driven aspect of the narrative has been the focal point. This 6th issue in the series opens up the playing field and explores the Empty Man virus’ larger game play. 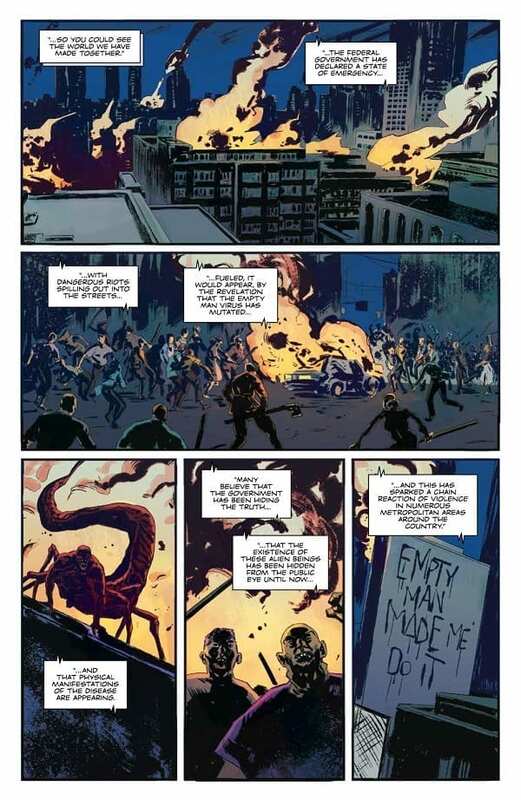 Bunn weaves the narrative through a city in meltdown, employing the use of Newscasts and mass hysteria to link the story threads together so that the comic flows like an unstoppable river of blood. Everything is bigger as Bunn draws in the world view. The action is more spectacular featuring cars chases and massive mutations; the horror is more disturbing with suicides and family murders; the scale of the virus’ invasion is more explicit. The purpose of this issue is to show the effect on the world that the Empty Man virus is having and that is exactly what Bunn achieves. He still keeps the central characters in play, but uses them to tell a larger story. They become the epicentre of a large storm sweeping through the city, one which Bunn revels in revealing. He has started to bring all of the pieces of the puzzle together. This is a gripping read. Jesus Hervas has his work cut out for him this month. The scale of the horror has increased and to get the full devastation across to the audience Hervas has produced open panels packed with chaos and mayhem. City wide riot scenes have been split across panels to highlight the scope of the violence, focusing on buildings in one image and people in the next. A huge traffic jam has been squeezed to the side of a page to illustrate to congestion. The sound effects, proved by letterer Ed Dukeshire, are haphazardly layered over the cars to increase confusion. There are many scenes of a horrific nature, each with a different emphasis, but Hervas gives them their own disturbing individuality. They are all part of a greater problem, as laid out in the narrative, but the individual incidents are personal and more disturbing because of this. The reactions Hervas gives to the perpetrators and spectators helps the reader to focus on each grotesque scene at a time before the script links them all together. The coloring by Niko Guardia helps to separate the scenes and create the atmosphere. 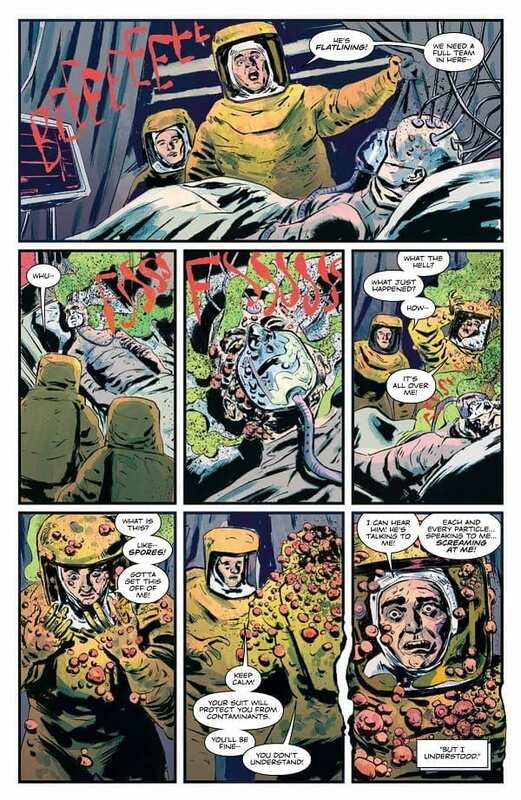 Whether it’s a disease ridden greens and yellows portraying the spread of infection or the cold blue washes over the villains, the coloring is an important factor for holding the readers concentration. By combing the expressive color palettes with the over the top, yet effective, sound effects each page grabs the reader and instils the sense of fear that the characters are feeling. Just like the virus in The Empty Man, this comic has been slowly evolving over the months. Each issue steps up the threat levels and turns a personal story into a world problem. A lot of end of the world stories tend to use the opposite approach; starting with the disaster and then introducing the characters. Bunn however has hooked the reader in with the family and is now opening up his world. The art work is suitably unnerving and nothing in this comic appears for mere shock value. There are shocking scenes but they have something to say in the narrative. The creative team are using the structure of the comic to build a world of terror. They constantly force the reader into difficult situations and places so that they feel the guilt or fear or claustrophobia. The Empty Man is a magnificent horror comic from cover to cover.